BlackBerry has had a hard time during these past couple of years and in particular, the last 12 months. Since BlackBerry decided that it was not going to be bought by another company, it has been trying to convince people that the once profitable BlackBerry brand will rise again and become an industry leader. 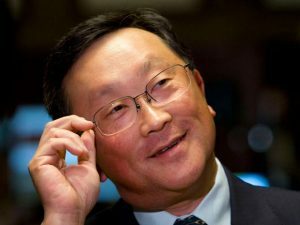 CEO John Chen is continuing to spread a message of hope with a new open letter, confirming that BlackBerry is not just alive but is thriving in some areas, particularly in the corporate electronics market. Only two months into his time as BlackBerry’s CEO, John Chen appears to be hopeful for what the future will bring, or at the very least, is putting on a smile to calm investors and business partners. At least for the foreseeable future, BlackBerry is focussing on its corporate deals with the US Government as well as with other multi-billion dollar companies. This is quite the departure from how the company was only a few years ago, when focussing on consumers was still BlackBerry’s most important job. While its accomplishments in the corporate sector are worth noting and celebrating, BlackBerry cannot rely on its partnerships with the DoD or other companies for its own survival. This fact has been highlighted by Pfizer’s decision to leave BlackBerry in favor of Android and iOS, something that at least a few corporations are doing. One of the few ways that BlackBerry has actually worked on building its importance on the consumer level is by bringing BlackBerry Messenger to Android and iOS. Following a series of leaks, the app has been made available on both platforms but a free application is unlikely to be of much importance when it comes to BlackBerry’s financial survival. Chen appears to know that corporate partnerships are not going to keep BlackBerry afloat forever, which has been seen with the company’s Foxconn deal that will bring a consumer phone to developing and emerging markets within the coming year.